Every once in a while the topic of wood species will pop up on a forum. This is pretty handy information to have when you choose a blade or have a custom blade made. I’d like to share a few species and information about them in hopes of aiding anyone is looking to construct a custom blade or is just curious. I’ll be using common names and a few bits of technical data to frame these species. The technical references made will include a rating on the Janka Hardness Scale, the specific gravity, and weight per cubic foot of each wood. The Janka rating is determined by measuring the force required to embed an 11.28 mm (0.444 in) steel ball into wood to half its diameter (thus leaving an indention of 100mm sq). I’ll keep it consistent by using pound-force readings. The specific gravity of a wood is its relative density to water. And the pounds per cubic foot is (as the phrase implies) the weight of a cubic foot of the wood measured in pounds. Every once in a while the topic of wood species will pop up on a forum. This is pretty handy information to have when you choose a blade or have a custom blade made. I’d like to share a few species and information about them in hopes of aiding anyone who has few questions. The specific gravity of a wood is its relative density to water. And the pounds per cubic foot is (as the phrase implies) the weight of a cubic foot of the wood measured in pounds. This African hardwood is suitable for medial and top plies, it has a nice soft/woody feel and a very smooth texture. Good for DEF+ to OFF- depending on the other plies it’s used with. This is a wood best suited for fast all-wood blades. It’s heavy and hard so it’s best paired with lighter and softer core and outer plies. It’s rarely used and when it is, it’s generally a medial ply. 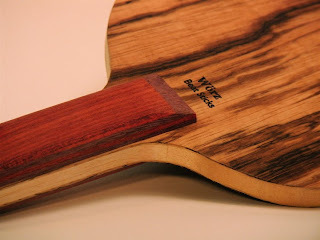 Balsa is one of the most diverse woods used in blade making. Due to it’s durability it’s only practical use is as a core (or handle for ultralight blades). It’s density can vary significantly and it’s behavior is relative to it’s thickness, thus it can be used for any range of speed. This wood is well suited to blade making. It’s in that ambiguous range of hardness and density which can be used for any ply. It’s generally used in cheaper blades but it can certainly make a quality product. Its behavior is widely determined by the plies and thus it is another very diverse wood. This wood is a good substitute for cypress. It has a soft woody feel and a very nice grain pattern when quarter sawn. It’s a perfect candidate for single ply-blades. Kevin from American Hinoki deserves some credit for popularizing this wood in table tennis blades. A bit harder and denser than it’s previously mentioned cousin, this wood is also a good candidate for a single ply, as well as a lovely substitute for Hinoki Cypress. There are several different species of cypress and they’re all usable for making blades. The Chamaecyparis obtusa, or Hinoki wood (as we call it) is perhaps the most sought after wood for blades. Unfortunately it’s just about impossible to get hinoki here in the United States, so I guess us woodworkers will have to settle for POC. Cypress is very much like cedar in it’s feel and appearance, but it tends to be more yellow. Cypress and the two cedars mentioned can serve as cores, medial plies, and outer plies. I haven’t seen any other blades made with Fir, but it’s one of my favorite woods for medial plies. It’s very much like the last three woods mentioned. This wood is very hard and very heavy. Its only practical use is as a very thin top ply. It melds well with balsa to create a long pips-friendly blade. This wood is from the Paulownia family. It’s a bit over double the hardness of balsa, but it remains very light-weight. This is a great core wood for faster blades with heavier medial and outer plies. Just like balsa, it cuts down on vibration and makes a blade with a little less feeling than something made with a wood like cypress. This wood is widely used by Butterfly. It’s a good offensive wood. It tends to feel pretty hard and has a sharp tone. Limba is a great wood for outer and medial plies. Its has a medium-soft feel. This wood is in 90% or more of all blades on the market. It’s commonly called Ayous or Abachi. It’s used as outer, medial, and core plies, as well as for some single-ply blades. It feels like limba. This wood is good is similar to ayous and basswood. This wood is generally used as a medial ply. It’s similar to cypress and the cedars in terms of its feel. This one is mostly used as a top ply, but I have seen it used as a medial ply. It has a hard but crisp feeling. This is an awesome defensive wood. It eats up the force of an incoming ball. It has a hollow feeling. Another hard and heavy wood. It has a surprisingly good woody feel. It’s not used by any major manufacturers but I’ve seen other custom shops use it. It’s definitely an outer ply only. Thanks fore such valulable information. Where can one purchase these woods? can u answer some questions for me??? could you please let me know about the thickness of each sheet of wood? Thank you. This entry was posted on Saturday, June 26th, 2010 at 10:24 am	and is filed under Uncategorized. You can follow any responses to this entry through the RSS 2.0 feed. You can leave a response, or trackback from your own site.